Exciting end of the year news! 7-9pm. I'll be playing a mix of holiday songs, originals and covers! Also on Friday Decemeber 21, if you happen to be at home wrapping presents, playing hookey, or just hanging, you can hear me singing one of Johnny Hawthorn's original Christmas songs on CBS's The Young and The Restless! and playing with not only Marty but also Zoe Axelrod at The Coffee Gallery Backstage! I will also be headed to Kansas for the first time in May to play The sunflower Sessions at Riverside Park. Hope everyone is happy and healthy!! It's a new year and i am revived (no, i'm truly exhausted from raising a 1 and 3 year old!!!) but i am committed to getting my self back a bit and that means new songs, gigs, recordings!! I would love to hear from you -support when i am tired, lost, blocked, down -whatever!! I need you and I'm hoping you can push me along to get back into the swing of being a songwriter and artist and singer!! Written by Ernest Troost for upcoming film, "Nightcomers"
I've been getting some nice radio plays on this show! Please check out weekly!! "Town and Country Underground" radio! Broadcast by Live 365 (click on the link) at 11am PST to hear the best in country/americana/folk/roots music! brought to you by Intraffikradio La! Also, on 88.5 fm Los Angeles KCSN on The Americana Matinee show airing Sunday mornings! Thanks Kim and Kat! I was interviewed by Diane for Southland Serenade! First show of 2013 Can be seen live AND online!! My next music showcase on Sat. January 5th. with an amazing lineup! This is one not to miss!! This is going to be a wonderful night of music. Awesome talent will be on hand to share their original songs with you! So be there on Saturday, Jan. 5th.. at 7:30 PM at Cahuenga General Store. Cahuenga General Store is one of the choice venues for acoustic music in the LA area. It is furnished out like an early 1900's General Store complete with actual antiques. It has good food, lattes and tea, and great music! We have a great line-up for this show - This is one not to be missed! * For those outside of LA the show will be streamed live at the link below. So come out or watch - it's Good For the Soul! The new CD, "Caught Up" is done! Wooooo Hooooo!!! It will be available on Itunes & CdBaby.com by early next week!! "Caught up in a kiss" is streaming now on the website -Enjoy enjoy enjoy! I'm in the final stages of mixing the CD! I really am trying to release the CD before the holidays and will keep updating the site as it gets closer! I have a great show coming up in 2013 -Sunday January 13 at McCabes Guitar Shop opening for Ernest Troost! If you own a copy of "All my change" Ernest wrote, "My baby loves me" & "Doubtin blues"! McCabes is an excellent Los Angeles music establishment playing host to many famous musicians like Jeff Buckley, Beck, T-Bone Burnett, Kathleen Edwards, Vince gill, Emmylou Harris and many many more! -I hope you'll check out the website (www.mccabes.com) and if you are in town, that you'll come support the show! I feel we are just about closing in on finishing the new CD! All my vocals are completed -we just need to do background vocals and clean up some guitar work then get to mixing!! Hoping for a June or July release!!! Keep on keeping ya posted!! Nice Mention in a CD review! I got a nice mention in a review for Ernest Troost's "Live at McCabe's" CD...Way to go Ernest!! 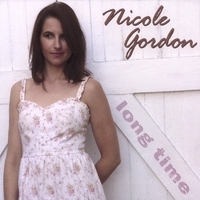 Please visit www.itunes.com/nicolegordon and you will see "A Midnight Clear"
We have started pre production on the new CD with Kevin Jarvis back in the producers seat as well as drumming for us! We are so excited and are slated for November to get 'er done!! Yee Haw!!! Hey Everyone! I just recorded a promo for "The Office" -click to check it out! My CD "Long Time" was a featured gift in this years Oscar gift basket given out to the winners and presenters at The Oscars!! Here's hoping Trent Reznor and Randy Newman are listening !!! Wishing Everyone VERY Happy Holidays and a healthy, jolly new year!! I was hanging out with my friends, BLiss Bowen and Amilia Spicer, rehearsing for a show and pressed record! Thank you for ALL your continued support and love and hoping to bring you a new album in 2011! Check out the amazing video for ORBIS.org -they used "Into the Light, out of the Darkness" from "Long Time" for the theme song!! CORRECTION!!! Singing at Dodger Stadium! I'll be back to sing the National Anthem at Dodgers Stadium on Saturday September 4, 2010! Hope you can come out for a great night! Thanks to everyone who helped in voting for me in the Lillith Fair Contest! As soon as the results are in, I'll let you know what they are!! Keep your fingers crossed we get to play in La, San Diego or San Fran!!! I started recording "Caught up in a kiss" with my friend Kevin Fisher at his studio in San Pedro, CA. It's a song I wrote with Gary Burr in Nashville about a year ago which has been getting a lot of buzz! Next up - recording a new cd!! !